In school, students are generally taught that species are groups of organisms that are capable of breeding among themselves and producing fertile offspring. As an explanation, it makes sense. Horses and donkeys illustrate a classic example of this definition in action. While they can breed, their mule children are sterile. It would be nice if all species distinctions were this clear cut, but nature is far too complicated to be bound by this rule. There are many situations in which this definition cannot be clearly applied, and some that it cannot be used at all. One place where this species concept breaks down is in paleontology. Paleontologists study fossils of organisms that have been extinct for thousands to millions of years. By looking at extinct animals, they can learn important lessons about the origins and evolution of modern organisms and ecosystems. There is a very clear problem when determining what is and isn’t a species when dealing with fossils: We have few ways of telling what populations were interbreeding. The small skull is a young Tyrannosaurus, but paleontologists thought it was a new species when they first discovered it. Paleontologists have to determine species based on physical characteristics. This is far from a perfect system. Growth patterns and differences between male and females can lead to misidentifications. It is not uncommon to see fossils reclassified when a paleontologist realizes that what they thought was a new species actually belongs to another. Female komodo dragons can reproduce asexually if no males are available. Even among living organisms species sometimes cannot be described only on basis of breeding capabilities. Many plants and microorganisms can reproduce asexually without needing a partner to exchange genetic material with. There are even animals that reproduce this way. Some female sharks are capable of giving birth to genetic clones of themselves, no male input needed. Certain species of stick insects have been reproducing completely asexually for millions of years! This diagram shows different ways ring species can be arrayed. Each colored bar represents populations that have slight variations between the populations closest to them. Populations with only small differences are able to breed with each other. The further away the populations are, the more variations there are. Green and pink populations have so many variations that they are no longer able to interbreed. Diagram A shows how this variation would look along a straight line (like populations arranged along a river). B and C show how this variation might occur for populations that form a ring, where populations can live close to each other, but still be too different to breed. Ring species are another fascinating example of a situation that the classic species definition cannot explain. Ring species have populations distributed in a ring-like shape. The sub-populations that live close to each other can interbreed without problem. However, where the ends of the ring meet, the sub-populations have been separated for much longer and are no longer capable of interbreeding. In ring species, certain sub-populations of what is called a species can interbreed, while others are incapable. 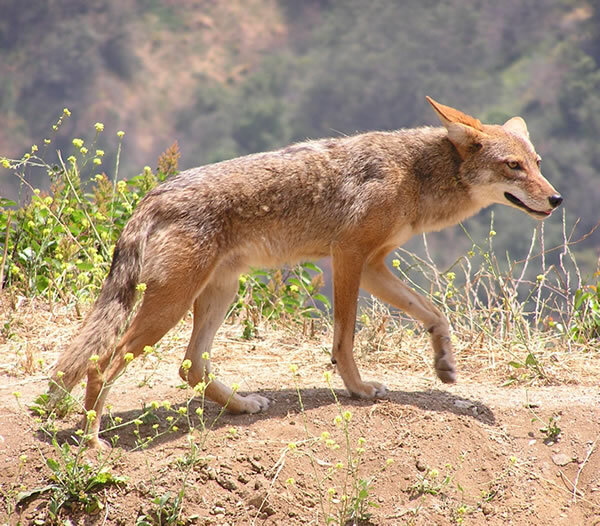 Somewhere between 150,000 and 300,000 years ago, red wolves and coyotes branched off from a common ancestor. These two animals are generally considered separate species and they have distinct appearances and behavior. However, something unusual is happening between these two species: They have begun to merge back into one. After thousands of years without interbreeding they have begun to hybridize in increasing numbers. The population size and habitat of red wolves have been drastically reduced in the last several hundred years. With fewer red wolf mates available, they are breeding with coyotes instead. The hybrids are fertile, and may in fact be replacing the red wolf species entirely. In this situation, we have two lineages that seemed unique begin to merge back together again. Cases like this are made especially difficult when scientists are attempting to preserve endangered species. There have been ongoing debates about whether red wolves should be prevented from breeding with coyotes to keep their species “pure,” or whether nature should be allowed to take its course and merge the two back into one. I’ve discussed the flaws with defining species, but all is not lost for classification. Scientists who recognize the problems with using breeding to categorize species have come up with new ways to define them. These different methods are called “species concepts.” Using breeding to sort species is called the biologic species concept. The phylogenetic species concept takes another factor into consideration: Ancestry. This phylogeny shows how my cat (Vlad) is related to other cats, large and small. Vlad is most closely related to Siamese cats, and most distantly related to tigers. Phylogeny is the study of the evolutionary history of organisms. A phylogenetic species is a species that has hereditary separation from other lineages. Phylogenetic species are groups that have bred only among themselves for generations, even if they are physically capable of breeding with others. In this example, if one species of rabbit became separated into two groups by a river, one species would become two species. The two groups of rabbits would only be able to breed with themselves as long as the river was there, even if they might be able to breed with the other group if given the opportunity. This definition of species also has its drawbacks, but it gives explanations for some things that the biologic species concept is unable to. Most raccoons are nocturnal, but trash is so abundant that some populations of raccoons have shifted to feeding during the day. Could we be witnessing the birth of a new species of daytime raccoons? In conclusion, species are not absolute. None of the categories that we use to define species are perfect, and there will be exceptions to every species rule. Forming a species is not an evolutionary end point. New species are constantly evolving from old and sometimes species recombine after being separated for thousands of years. The evolution and maintenance of species is not always easy to explain, but that makes it all the more exciting to study.